Marble Sheep is a Japanese psychedelic rock band playing wild, ecstatic, hypnotic, psychedelic, and noisy rock who were formed in 1987 by ex-White Heaven guitarist Ken Matsutani, the owner of the Captain Trip record label. While Acid Mothers Temple has awakened new interest in cosmic explorations and extended jams, Marble Sheep takes you light-years further! 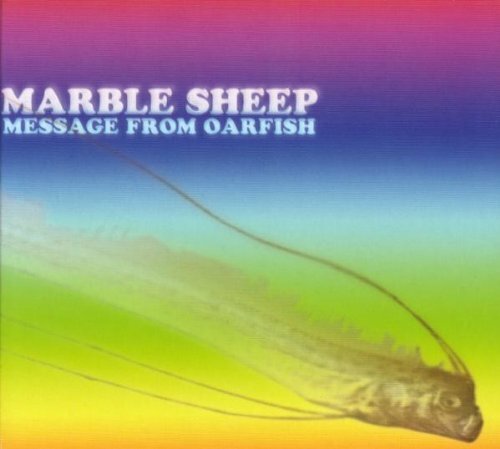 Message from Oarfish is their killer 14th release and I want to hear more from this band! Marble Sheep is Ken (guitar and vocal), Tak (guitar), Rie Miyasaki (bass and chorus), two drummers (Sawada and Iwamotor), and Marby, the dancing sheep who appears on stage at the end of their shows. The opening song “Tears” is a Krautrock tour de force sounding initially like Pink Floyd’s “Astronomy Domine” and gradually morphing into something that could have been on Neu ’75. Just listening to this band, it is no mystery why they took Europe by storm in March 2006 (they had planned for a low-budget tour) and were immediately signed to a number of dates and festivals including Jean-Hervé Peron’s Avantgarde Festival! They rock hard combining the best elements of Krautrock, punk rock, and psychedelia and the results are a pleasure to experience. Unlike many of their contemporaries who try so hard to just imitate the masters, Marble Sheep effortlessly stands head and shoulder above them. Definitely seek this band out, you will not be disappointed!